What this competition is all about. 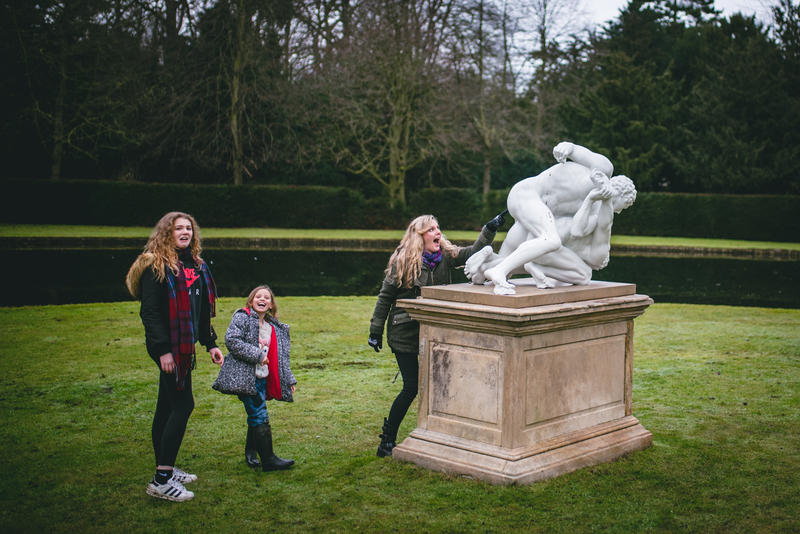 This is me, the one pointing to the naked bum of a statue. The other poor souls are my 14 year old daughter Cassidy and step daughter Darcey, 8. This photo says everything about our crazy little family. There I am being a clown, Cassidy in usual disgust and embarrassment and Darcey hilariously laughing at me. I LOVE THIS PHOTO! It’s real and it’s funny and it takes me back to that moment every time I look at it. I know in years to come, I will love it just as much as I do right now. This is want I want to do for you. I want to freeze frame you and your family in moments that are real. The everyday moments that make up your life. I was lucky enough to have a Dad that was obsessed with taking photos, we have hundreds of images that I adore. Like these: To the left is me aged 9, and my dog Josh. It was taken by my Dad outside my old family home in Wheldrake, where I grew up. On the right, I’m cuddling my dog Benji in the back garden of our home on Tadcaster road. It’s memories like these that make me love taking family photos for other people. Do you remember the wallpaper you had in your room growing up? (I had blue and red cats on mine) Do you remember your favorite cereal and the box it came in? It’s all those fond memories I want to capture by spending a day photographing you and your family going about your daily routines. The photos you can show your grandkids and laugh about the haircuts in those days. There will be 3 winners of this competition. I will be spending a day with each family – documenting your morning routines, school run and driving off to work. Then the evening time you spend together as a family, cooking and eating tea, pyjama time and bedtime stories. You get to keep all the selected and edited images, print ready and in all their glory. Why? you ask. This is something I want to offer families across North Yorkshire. But I need a portfolio of images first. So you are helping me do that. The images will be blogged and shared on social media and used to show other families examples of what they can get. So, thank you for putting yourselves forward. I cannot wait to announce the winners on Saturday 3rd March at 12pm. If you can’t tune in, don’t worry, I’ll be sending emails out to. If you haven’t already entered, applications close on Wednesday 28th of February. Please contact me here to receive your entry form. I thought I would leave you with a few snaps of me and my family over the last 3 years.